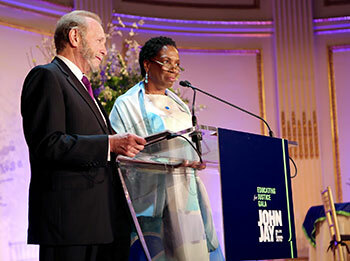 New York, NY, May 25, 2016 – The annual Educating for Justice gala sponsored by the John Jay College Foundation Board of Trustees raised over $800,000 gross – a record amount – and drew 325 friends and supporters of the College. Proceeds from the gala will support scholarships and programs that help students achieve their academic and career goals. Held on May 23rd at The Plaza Hotel, the event’s honorees were Lin-Manuel Miranda, creator and star of the Broadway hit Hamilton; Peter J. Beshar, Executive Vice President and General Counsel of Marsh & McLennan and member of the John Jay College Foundation’s Board of Trustees; and the Tow Foundation. The special evening also featured a tribute in honor of Rossana Rosado, a trustee of the John Jay College Foundation and a Distinguished Lecturer in Latin American/Latina/o Studies, who was recently appointed as New York’s next Secretary of State. To view photos from the Educating for Justice gala (#JJCGala), click here. To view videos from the gala, click here. The College also announced the launch of a $75 million campaign, co-chaired by John Jay College Foundation Trustees Arthur Mirante and LaBrenda Garrett-Nelson. Impressively, $35 million in grants and pledges have already been received. The John Jay 2020 Campaign will be focused on supporting student success, to ensure that students are able to overcome adversity, shatter expectations, and strive for more. Joining the Gala festivities were prominent guests and civic leaders such as New York Attorney General Eric Schneiderman, Maria Cuomo Cole, Kenneth Cole, Soledad O’Brien, New York City Veterans Services Commissioner Loree Sutton, former Bronx Borough President Fernando Ferrer, former Attorney General Oliver Koppel, Probation Commissioner Ana Bermudez, Council Member Helen Rosenthal, New York City Corporation Counsel Zachary Carter and CUNY Chancellor James Milliken. In addition to the gala award presentations, journalist Soledad O’Brien auctioned off two tickets for Hamilton, raising $11,000 in support of student scholarships. She also interviewed honoree Lin-Manuel Miranda on stage. Miranda, recent winner of a MacArthur Foundation “genius” grant, Grammy Award, and Pulitzer Prize, discussed his inspiration for Hamilton as well as why it was important for him to figure out a way for students to have access to this sold-out show. Miranda and the producers of Hamilton are helping to improve history education through a partnership with the Rockefeller Foundation. The initiative will enable 20,000 underprivileged New York City high school students to see the show. Click here to view the thank-you message to all donors and supporters of the John Jay Gala.